H2O Lounge Four Jet Option The Four jet system contains 2 jets X 2 sides = 4 in the basin. 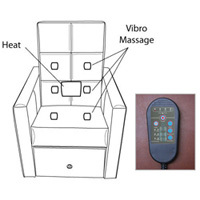 The jets are directional and can be aimed to the point of massage. 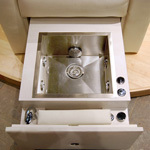 The water flow is injected with air bubble and the volume of bubbles is controlled by a knob on the counter of the basin. The flow of water through the pipes is sanitized by an ozone module. Ozone is also injected into the water stream. Ozone sanitation kills 99.9% of germs and viruses in 20 to 30 minutes during jet use and is safer than chlorine. 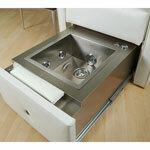 Most pedicures available have 2 jets, this system has 4 set in a surround true hydrotherapy configuration. 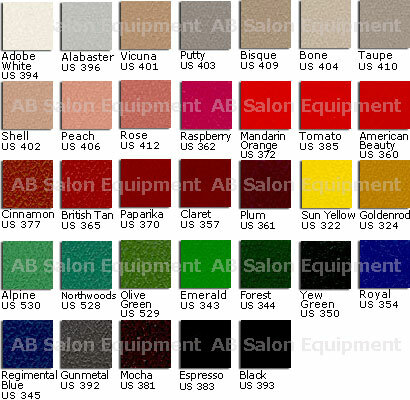 Only for the H2O Lounge Series Pedicure Chairs. 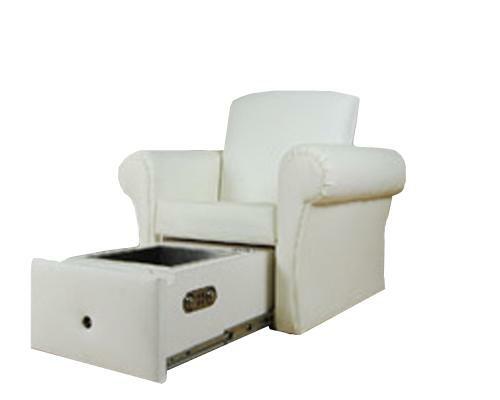 H2O Lounge Sanijet Option For H2O Lounge Series Pedicure Chairs only. 2 Jets. It's time to discover SANIJET Pipeless™ technology-the ultimate blend of powerful hydromassage and unmatched sanitation. SANIJET systems deliver the ultra-quiet experience clients prefer, can be completely and thoroughly cleaned in approximately five minutes, and enable the safe use of the signature additives that make your spa unique. Each jet is self-contained and installs directly into the side of the bath. Driven by a quiet and efficient motor, the jet draws in water-up to 18-20 gallons per minute-and propels it back into the bath to create an invigorating and rejuvenating hydrotherapy experience. 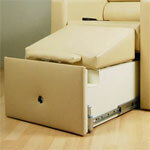 And with this innovative design, cleaning and maintenance are quick and easy. H2O Lounge Series Stainless Body Option for H2O Lounge Pedicure Series only. 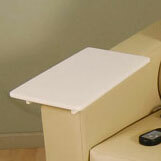 H2O Lounge Series Manicure Trays made of Corian solid surface. Removable. H2O Lounge Pedicure Ottoman for H2O Lounge Series Pedicures. 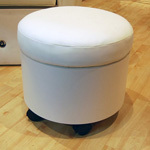 Removable ottoman fits over the basins. Made in the USA.